Aerial platform trucks provide the department with an extremely powerful tool for rescue, ventilation, and extinguishing fires. All Fire Apparatus Manufacturers’ Association (FAMA) member companies are concerned with firefighter safety, and those that produce products that lift people into the air are particularly sensitive to promoting safe practices. This article will discuss the issue of platform safety, focusing on the aerial device itself and its operational characteristics. Because of their tremendous capabilities and working heights, elevating platform devices are highly engineered products that must be strong but lightweight. As a result, the vehicles on which the aerial platform devices are installed are complex and require skill and training to use them effectively. The key parameters regarding structural safety factors, truck stability, and many more key requirements are covered in detail in the 2016 edition of National Fire Protection Association (NFPA) 1901, Standard for Automotive Fire Apparatus. The latest edition includes several changes that affect aerial platform design. The FAMA Apparatus Safety Guide is also an excellent source of information regarding aerial apparatus safety. As a young engineer, I was involved in the design of tower cranes and marveled at the operators’ ability to lift heavy construction materials at great heights and precisely place the material to the workers above. The operators appeared to be experienced and well-trained, understood the equipment, and had tremendous skills. Much like the tower crane operator, the aerial platform operator should have this level of understanding, training, and skills. Because of the versatility and capability of platform aerials, it is critical that you read and understand the operator’s manual. You should complete a comprehensive study of the manual and have a thorough knowledge of operating instructions, control systems, load capacities, safety precautions, and limitations. It is important to understand the capabilities of your unit, because vehicle capabilities change as technology develops and also change from manufacturer to manufacturer. The experienced operator should avoid complacency and always keep focus on the task at hand. If you are new to the truck, make sure you find the original manual information to review, and work with an experienced trainer to understand the device. Fire ground scenarios naturally create a stressful environment; use your training and practice time to become confident in your abilities at the scene. Give your undivided attention to the aerial during operations; if distracted, stop operations. In recent years, the technologies used in platform control systems have advanced considerably. These advancements can improve both the controllability and the safety of a platform. For example, it is very common to have joysticks that have ramping characteristics that smooth out abrupt starts and stops. However, the ramping feature may be different from unit to unit, and older units will likely not have the feature at all. It is important to understand the control system of the specific truck. Another example of technological enhancement is controlling platform speeds based on aerial position. An extended platform rotating at high elevation angles moves at a relatively low speed. However, with the extended ladder rotated at low angles at the same speed, the platform will move with high speeds relative to the ground. This can be as high as 10 feet per second. At these speeds, use extreme care to safely control the platform and minimize potential hazards. Aerials equipped with newer control technologies will adjust the platform speed based on the elevation angle to be consistent throughout all ranges of elevation. Once again, know your truck. Telescopic and articulated boom platforms and some telescopic devices use the concept of envelope control to provide the safe operating range for the device. Essentially, there are a number of sensors that determine position, load, outrigger stance, wind, and so on and control the envelope within which the platform can move. These systems are integrated electronically, provide comprehensive display technology, and can adjust the range of motion based on a large number of parameters. Understanding the capabilities, the displayed information, and the range envelope of operation of these systems is vital. The load charts or displays are located near the platform control console and at the turntable operator’s position. Understanding these charts is critical to safe operations and effective performance. All platforms have a rated capacity dry and a rated capacity while flowing water. The minimum dry capacity rating for a platform is 750 pounds, but most platforms are rated for 1,000 pounds. Platform ratings are commonly reduced 50 percent for water flow situations because of nozzle reaction forces. Manufacturers provide an additional allowance for equipment to be mounted in the platform and on the device. You must deduct equipment loads that exceed those values from the rated capacity. Any loads on the lifting eyes under a platform must be deducted from the personnel load in the platform. For platforms with climbable ladders, distributed loads along the ladder are also stated. Generally, the allowable loads are significantly increased at higher angles of elevation to handle as many as 10 to 12 people. 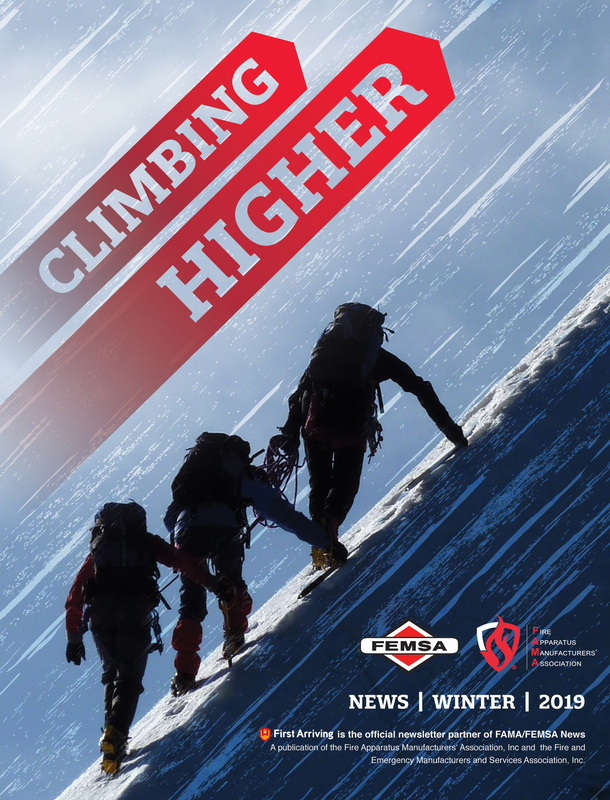 If people are descending the ladder during a major rescue, it is important to distribute the weight on the aerial device evenly, with 10 feet minimum between personnel. This balances the weight distribution and provides some buffer distance if someone loses footing. The aerial device is designed as a cantilevered structure. It is best to position the aerial a few inches above, or closely adjacent to, the structure. Powering down on a structure could cause permanent damage to the aerial assembly. The aerial is designed for gravity loads. The aerial is not designed to be used as a crane, a lever, or a battering ram. The aerial has the power to knock out windows, tip over walls, or ventilate roofs, but it is very likely that structural damage will result. This damage may not be readily apparent, but cylinders, cables, welds, and hydraulics can be affected; this damage could show up later. Sloped surfaces. Do not operate the aerial unless the truck can be leveled within the manufacturer’s guidelines. The aerial capacity rating is based on the level condition of the turntable. Manufacturers generally provide turntable level indicators, usually colored green (full capacity), yellow (50 percent capacity), and red (no capacity), on the vehicle to indicate the trucks level status. For example, a platform with a 1,000-pound capacity in the green zone would be rated at 500 pounds in the yellow zone. Windy conditions. Aerial devices are designed to operate in windy conditions up to a point. Most manufacturers designate the maximum wind speed above which operations are not recommended. These wind speed values are often in a range of 35 to 50 miles per hour (mph). Although the aerial may be capable of operating in high winds without tipping, this does not mean it is safe to allow personnel to climb in high winds. Common sense and your safety officer’s guidance should dictate if the work to be performed can be accomplished safely in high winds without undue risk to personnel. Climbing an aerial in strong winds is not prudent. Cold weather conditions. A substantial buildup of ice is probable in freezing weather when operating a master stream from the platform. Engineers cannot replicate actual fire ground ice loading in any practical way. To accommodate ice loading, an additional weight load is applied to the aerial to account for ice buildup. The manufacturer will normally state the magnitude of ice buildup accounted for in the design and potentially on the load charts as well. In reality, the ice accumulation is more irregular and concentrated than can be predicted. Use common sense in these conditions. The most troublesome impact of ice buildup on the device is on the telescopic waterway and the extension system and power cable system. Ice buildup on the aerial waterway can cause damage to the seals, wear bands, and may burst the main tubes. During freezing conditions, it is best to maintain water flow while extending or retracting the aerial. If ice exists between the waterway tubes, extending or retracting the aerial will break the waterway and potentially cause injury. Use extreme caution when retracting or extending an aerial with ice buildup. Move the structure slowly to allow ice to fall away. To avoid potential injury, ensure that no persons are under the aerial during this operation. Electrical storms. Since aerials are not insulated, they act like big lightning rods, if at all possible, do not operate the aerial during an electrical storm. If the on-scene emergency conditions dictate aerial use during a lighting storm, use extreme caution during operation to avoid severe personal injury. Keep personnel not involved with aerial operations well clear of the unit. Contact with power lines. The fire service has experienced severe injuries and deaths from contact with power lines. The aerial assembly is a metal device and is not insulated. You must keep the aerial at least 20 feet from overhead power lines with voltage of less than 350 kilovolts and 50 feet for higher voltage. Be cautious of your position when multiple power lines are present. NFPA 1500, Standard on Fire Department Occupational Safety and Health Program, requires that the power be shut off in firefighting locations, but this may not always happen in a timely manner. Be sure the power is shut down at the scene. When elevating the aerial near power lines, personnel on the ground should stand clear of the vehicle, and avoid stepping onto or touching the vehicle until the aerial is in a safe position with respect to the overhead power lines. The fire service has experienced severe injuries and deaths that could have been avoided if people were using appropriate safety belts or fall arrest harnesses when in the platform. The first line of defense in keeping people safe on the fire ground is the use of personnel protective equipment (PPE). When working on an aerial device, this must include a ladder belt or safety harness. NFPA 1983, Standard on Life Safety Rope and Equipment for Emergency Services, provides requirements for ladder belts and specifies that the tether cannot exceed 24 inches. A short belt and hook is considered a travel restraint and is used to limit movement to the confines of the platform; it is rated for a 450-pound anchorage. A fall restraint has a belt and hook with a lanyard, allowing 18 to 24 inches of movement and a 900-pound anchorage rating. A fall arrest system uses a body harness and shock absorbing lanyard and is used to arrest an occupant in a fall with an anchorage rating of 1,800 pounds. With your ladder belt and tether in place, it is important to develop good disciplines for using them. The NFPA recommends that you should be tethered to a platform anchorage point on the platform any time the device is in motion and whenever you are off the ground unless you are actively climbing or descending the ladder or entering or exiting the platform. Never operate the platform by yourself. Most fall arrest harnesses and tethers are not designed for self-rescue. If you fall while tethered and operating solo, you may hang without the ability to climb back onto the device. People can only hang briefly using a fall arrest harness before blood circulation is cut off and they begin to die. Although the primary operator should always be at the control station at the base of the device, other personnel are equally important. It may be necessary to have one or two spotters on the ground, especially while operating in tight quarters or around power lines. The spotters and the operator must practice together, perfecting a system of communication that will minimize confusion. If personnel in the platform are overcome by smoke or otherwise incapacitated, the turntable operator can move the aerial to a safe location. Use extreme care whenever climbing to or from a platform. The platform operator and turntable operator should be fully aware of any person on the aerial device and absolutely should not move the aerial. A number of serious accidents have occurred from people climbing on a moving ladder. If feet or limbs are caught between rungs or bracing members, the power of the aerial extension system can cause very serious injury. When operating the platform at night, ensure the operator control station and aerial lights are turned on and properly positioned. Your aerial platform is a complex machine that requires proper maintenance and care before use. Understanding your operator and maintenance manuals and performing the daily, weekly, and monthly inspection checklists are very important. Aerial devices are machines that need to be exercised to be kept in their best working order; perform operational readiness tests at least weekly. Note any signs of potential trouble; pay close attention to unusual noises or vibration, oil leaks, erratic aerial functions, lighting outages, component damage, and so on. In the platform, verify that the platform gates are working properly, latches are secure, and equipment is properly mounted. Ensure axes, pike poles, folding ladders, and equipment stowed in the platform and on the sides of the aerial device are secure, especially after use. NFPA 1911, Standard for the Inspection, Maintenance, Testing and Retirement of In-Service Automotive Fire Apparatus, designates the critical points on the device that should be regularly inspected. Make sure your inspections have been completed and the certifications are up to date. Safety may not be an exciting subject, but it is one that we owe to ourselves and our loved ones to practice. 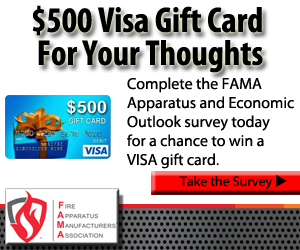 You can find more information on aerial safety in the FAMA Apparatus Safety Guide, available at fama.org. FAMA is committed to the manufacture and sale of safe, efficient emergency response vehicles, and equipment. 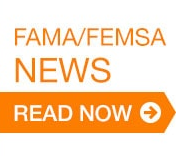 FAMA urges fire departments to evaluate the full range of safety features offered by its member companies.